Well, I've always wanted to do some art for delicious, delicious wine. Yummers. Everytime (which I swear is not often) That I peruse the wine section I am always drawn to the artwork on the labels and with Capital Grill offering an opportunity via contest to draw something up, hell yeah I took it. I had another design but its due tomorrow and I cannot humanly possibly get it done. Like...Unless I had a TARDIS. (Wish I had a TARDIS.....mmm) But! I'm REALLY happy with how this turned out. Actually to the point I don't want to part with the original. Hope you like it! I'll keep you posted! Next show is the Non-Sports Card Update show in Allenstown, PA. this weekend. (I'll have a TON of cheap cards. Just trying to get them out to new homes.) I'll be Severly cutting back on cards ( like to just Perna Studios) so this will be the last time to grab some APs from certain sets. Also looking forward to New Orleans Comic Con. Just booked a couple haunted hotels! So excited! I love New Orleans and it was definitely one of my favorite shows last year. See you there! 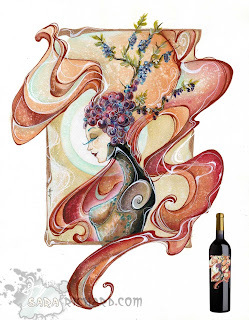 I don't really drink, but if I saw a wine with a label like that I would buy 5 bottles.